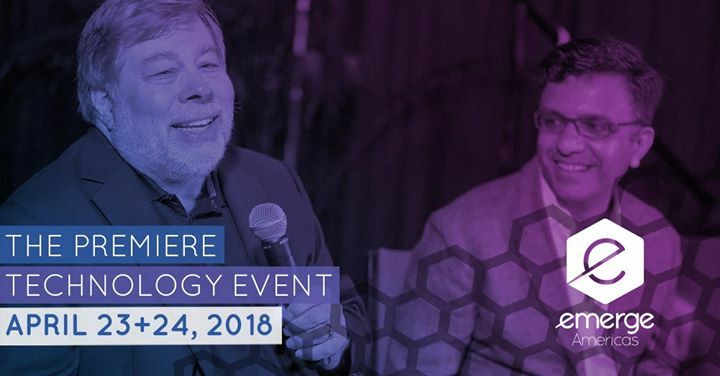 eMerge Americas, the premier technology event connecting Latin America, North America and Europe, kicks off in just 2 weeks! Details on the Startup Showcase, the Charity Golf Tournament, the Visa Challenge, and the CNBC Disruptor Panel are now available. Plus, don't miss a special announcement from Pitbull on a new technology initiative he is spearheading. "eMerge Americas 2018 is just a few weeks away but Miami is already buzzing with activity and excitement," said Xavier Gonzalez, CEO of eMerge Americas. "We have countless developers already hard at work on the Visa Challenge, gearing up to present their big ideas on the main stage, and over 100 startups will soon be descending on Miami, ready to compete in our annual Startup Showcase. I look forward to welcoming everyone to Miami, the world's next big tech hub!" Over 100 startups from around the globe—from Colombia to France to Australia—will be convening at eMerge Americas for the Startup Showcase, where they'll have the chance to pitch their big ideas to investors and venture capitalists. eMerge Americas and The First Tee Miami have again partnered to host the eMerge Americas Charity Golf Tournament, on Sunday, April 22. Proceeds will go to The First Tee Miami whose programs impact the lives of children, veterans, and those with special needs. For more details visit thefirstteemiami.org. The Visa Challenge at eMerge Americas 2018 kicked off March 22, 2018 at the Visa Miami Innovation Center, giving developers, startups and entrepreneurs the opportunity to discuss innovative digital solutions that can be utilized in different vertical industries. Participants have a month to sharpen their business pitches prior to the live competition at eMerge Americas on April 24. The CNBC Disruptor Panel will take place on the eMerge Main Stage on Tuesday at 4 p.m., featuring Stephen Ufford, Co-Founder and CEO of Trulioo, and Jay Kaplan, Co-Founder and CEO of Synack, companies both part of the 2017 CNBC Disrupter 50.
eMerge Americas serves as the preeminent innovative thought exchange transforming Miami into the technological hub of the Americas. By connecting global industry leaders and investors with America's top business executives, technology decisionmakers, and entrepreneurs, partnerships are forged that spur visionary innovation and technological advancements for the betterment of business and society. The eMerge Americas founding partners include: Medina Capital, A Rod Corporation, Greenberg Traurig, Knight Foundation, Miami-Dade County, and the Miami Herald. For more information about eMerge Americas, please visit: emergeamericas.com.